One of the things I like about long weekends is that I have the chance to read books for pleasure. I had thought before that law school has effectively killed my love for books but thankfully I discovered that it has not. For this Holy Week, I was able to read some books and I thought it would be apt to share to you my thoughts on “The Purpose Driven Life” by Rick Warren. 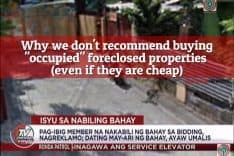 You may think initially that this has nothing to do whatsoever with Foreclosure Philippines. 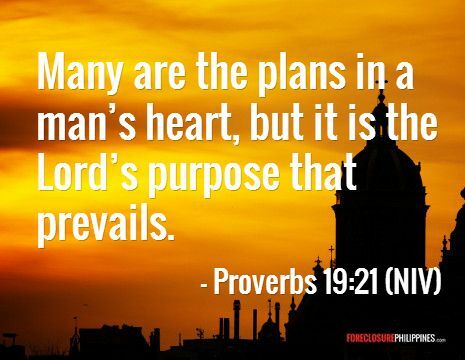 On the contrary, the “Purpose” is the driving force behind it. My husband is very fortunate to have found his purpose in life – Helping others by promoting financial literacy and financial freedom through real estate investing – and his tool in doing this is his site ForeclosurePhilippinescom. Many people, even those who have reached their seventies or eighties have not yet found their purpose in life and are still asking “What is my purpose in life?” or, as said in the book,”What on earth am I here for?“ (this includes me, although my husband’s purpose is big enough for the whole family so that will do for now) and so I thought it would be good to distill the book’s lessons for everyone to ponder on, most especially this Holy Week. Worship – What will be the center of my life? Service – What will be the contribution of my life? Mission (to unbelievers) – What will be the communication of my life? Fellowship – What will be the community of my life? While most of the above are basically about getting to know God more, and spreading his word to others, which of course we all know we should do if we are Christians (I do not really want to get into a debate about religion mainly because I respect everyone’s beliefs and do not want to impose my own beliefs on others. I do not want to be preachy as well. ), I would like to concentrate on no. 3 – finding one’s CONTRIBUTION in life. I believe that everyone, whether Christian or not, is innately good and has the innate desire to make a difference in this world. I found the tips in the book on how to find your contribution in life quite helpful. Personality – Whether you are outgoing or not, etc. Family experiences – What did you learn growing up in your family? Educational experiences – What were your favorite subjects in school? Vocational experiences – What jobs have you been most effective and enjoyed most? Spiritual experiences – What have been your most meaningful times with God? Ministry experiences – Have you served God in the past? Painful experiences – What problems, hurts, thorns, and trials have you learned from? The book states boldly (and I cannot agree more) that a person’s greatest ministry will most likely come out of your greatest hurt. It is during times of failure and hurts that we think more, dissect and re-dissect the problem and how it happened, and how it could be solved or avoided, etc. I have in mind some areas I can concentrate on, based on the guidelines above. Nothing definite as of the moment though, but I am getting there. Personally, I like to be simple in my thinking. The ultimate goal is eternal life in heaven. The penultimate goal is happiness on earth. Both could be achieved by helping others. Simple rules to live by: The Golden Rule / Love one another as I have loved you. As to how we can help others specifically, here comes the contribution, which we can hopefully discern by using the guidelines SHAPE above. When you have a clear purpose in life, it gives your life meaning and direction. I have always kept in mind that the shortest distance between two points is a straight line, and without a clear direction and goal to reach, how can a person reach whatever destination he is aiming for? Life gives us so many choices, not just two for every issue, and even a matter as simple as what to eat can be difficult to answer as you have so many choices. Now if you have a Life Purpose Statement, it would be easier for you to keep your eyes on the goal. You will be able to separate what is important and what is not, and it will be easier for you to decide among the choices available. Take time to craft your own Life Purpose Statement. If you go through life without it, banat lang ng banat (come what may), at the end of your life it would be difficult for you to pinpoint what difference you have made in this world, if any. I really hope this piqued your minds at the very least. There are moments in life when I think of philosophical thoughts – purpose, happiness, freedom, and success being on top of the list – these abstract things that are so hard to process but are essential to life. God gave up his life for us, and we are given time to reflect on His great sacrifice, not just this Holy Week but everyday. If we are able to determine our purpose and how we can help others as He has directed us to do, then we are one step closer to repaying Him for His gift, and making this world a better place. Have a blessed and meaningful Holy Week.